Vortex Impex Pvt. 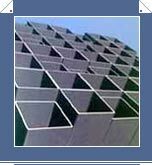 Ltd. Manufacturers and Exporters of Hollow Sections, Structural Hollow Sections, Hollow Steel Sections, Square Hollow Sections, Round Hollow Sections, Mild Steel Black ERW Square Tubes, Rectangular Tubes & Round Hollow Section Tubes and Hot Rolled Steel Sections as per customer's requirement. These sections are available with anti rust oil coating from inside & outside to ensure safe delivery to end customers.